Hey! This will be a week since I rebooted this thing. Go me! Anyway, last night was, as most Tuesdays are, game night. Herewith, a brief after-action report. (Astute observers will note a preponderance of people whose names begin with J. We are still working on finding a cause for this clustering effect.) Initially having six people, we split into two groups of three. Ocean’s arrival filled one group to four just as the first game began. Excelsior! We didn’t name the two groups, so I will make up names for them. Team Not-Me consisted of Jim, Jason, and Julie. Their first game was Harbour, a short, relatively light game of resource collection, building, and market manipulation. Harbour. You can tell it’s a sophisticated game by the “u” in the name. Once that was done (I don’t know who won, but I am fairly certain the winner’s name begins with J), the group moved on to Viticulture with the Tuscany expansion. The expansion provides a legacy structure that allows the winner to “uncork” a new feature, making the next game very different. This is the second time it’s been played in my group, so it has been enhanced by the previous winner and last night’s winner (Jason). 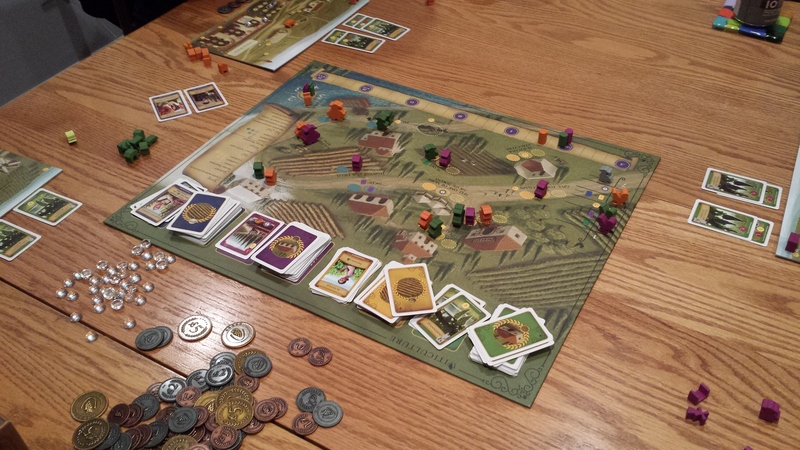 Viticulture. Wine wine wine spodie-odie. Meanwhile, back at stately Wayne Manor… you know what I mean. Team The Other Team consisted of me, JR, and Jessie, with Ocean joining us shortly after we had set up the first game. Which was Lords of Xidit, brought to you by the people who make Seasons, and set loosely in the same world. Lords of Xidit. No, I don’t know how to pronounce “Xidit” either. In this game, the players travel around the map from city to city, recruiting units from five different classes (Farmer, Bowman, Infantry, Cleric, Mage) and using those units in various combinations to defeat threats. A game turn consists of six actions, performed one at a time clockwise from the current starting player. In a single action, a player can move along a road to a new city, recruit units or defeat a threat in a city (depending on which is available), or just wait and twiddle their thumbs. The tricky part is that all six of a player’s actions must be planned in advance, which means the players have to consider the timing of their actions – someone might get to their destination first, leaving them twisting in the wind and unable to do what they had planned. In addition to the advance planning mechanism, the game has a couple of other interesting features. Empty recruitment markers cycle to become future threats, and defeated threats cycle to become future recruitment markers, and the players can see what is coming down the pike. This also feeds into the planning. The endgame scoring process is interesting as well. Defeating a threat entitles the player to take two of three possible rewards: Reputation, Gold, or Sorcerer Towers. 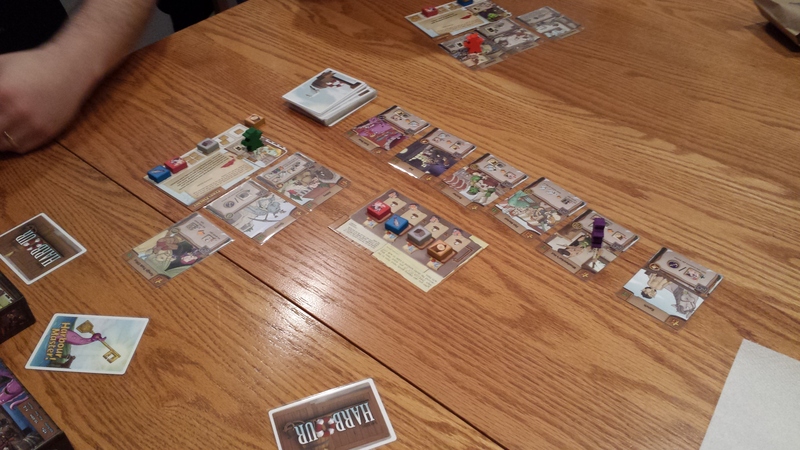 After 12 turns, the game ends and each player is ranked according to their accumulation of each of these three rewards, in an order determined at the beginning of the game. (In our game, the order was, in fact, Reputation, Gold, Towers.) The last player in rank in each reward is eliminated and cannot win, but their score in the other rewards counts toward determining everybody’s rank in the other rewards. In our game, Ocean was last in Reputation, so he was out of contention; but his rank in Gold was higher than everybody else’s pushing the rest of us down in rank. I got eliminated in the Gold ranking, and then Jessie defeated JR on Towers to win the game. The game is designed for four, but also plays with three players (using a dummy player to work out the rankings at the end) and with five (in which case the lowest two players are eliminated in the first ranking). It took us about two hours, including learning the rules. Since Team Edward was ensconced in Viticulture when we finished, we opened up Stefan Feld’s Bruges (with the City on the Zwin expansion). 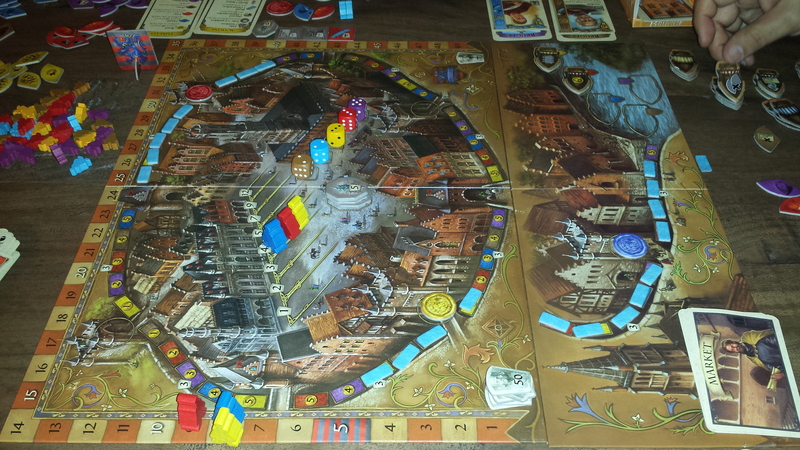 We are a Feld-friendly crew, but I had forgotten how enjoyable this game is. Bruges. Not even close to color-blind friendly. 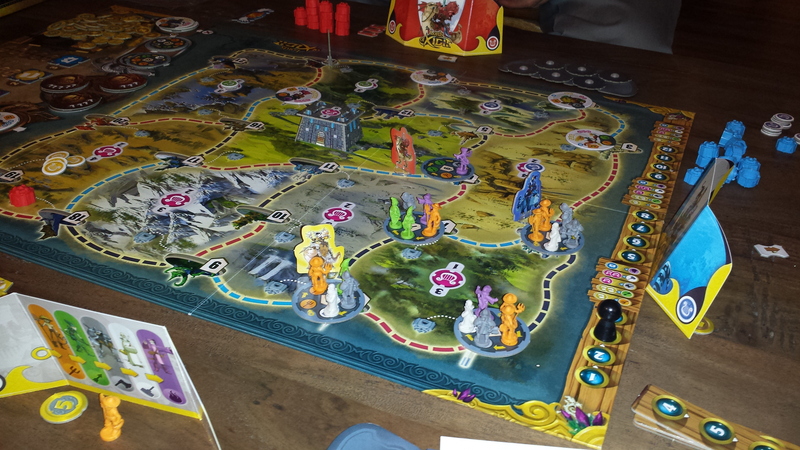 As with most Feld games, there are multiple paths to victory and a half dozen fiddly ways to score points, and players must make hard choices. Each turn, players draw up to a hand of five cards, from two decks containing cards of five different colors (red, yellow, blue, purple, brown). For each draw, a player has two choices – usually two different colors, but sometimes both the same). Then the current starting player rolls five dice – one in each color; the pips on each die establish certain costs and values and may result in the players’ receiving threat tokens. The players then take turns playing a card from their hand, one at a time clockwise from the starting player. Each card may be played in one of six ways: to gain workers of the corresponding color (for future use); to gain money equal to the number of pips on the corresponding die; to eliminate a threat of the corresponding color; to build a section of canal by paying money; to build a house by expending a worker of the appropriate color; or, once a house is available, to put a person into a house by paying money. A person in a house in a player’s display will have a special ability that may happen just once when played, or may be activated by spending a worker of a particular color, or if a certain condition is met. The expansion adds (optionally) more cards; boats each turn that allow a player who builds a canal to get an extra benefit; and a market that grants a player a bonus of some sort when they take a particular action during that turn. Each player plays (usually) four cards per round, then the starting player rotates clockwise, and the cycle begins again. The game’s final round is triggered when the last card in either of the two decks is taken. (There is a deck of additional cards that can be used to fill out the rest of the round as needed.) When the player’s have taken their last actions, the scores are totaled up and – mirabile dictu! – the player with the most points wins. As noted, there are multiple ways points are scored, and since most of the scoring is left to the end of the game, it can be difficult to gauge how well one is doing. Last night, I thought I was doing miserably, but I wound up in second place, two or three points behind Jessie and ahead of JR by about the same margin. A good time was had by all. Having won two games in a row, and every game he played last night, Jessie was placed on probationary status, and swore never to do it again. Also, I need to take better pictures. Posted on April 30, 2015 April 30, 2015 by dansomeonePosted in Game Night RecapTagged Bruges, Harbour, Lords of Xidit, Stefan Feld, Viticulture.